See, see, see.. I'm on a Bad Guy P!! This tune of life has officially got a remix to it featuring one of Nigeria's hottest R&B artists - Banky W and one of Ghana's hottest rappers - Sarkodie. 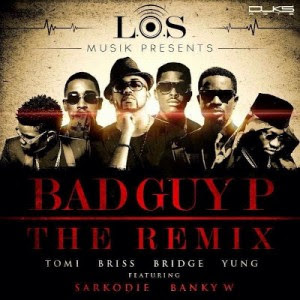 Both Banky W and Sarkodie blessed the track with some fresh new bars and even though Banky is not a rapper, he done a pretty impressive job on the track. As for Sarkodie - he SLAYED as always (even though I don't understand what he said - lol). With new verses enforced in the remix from the members of the group, listen to Tomi, Briss, Bridge and Yung all deliver in the remix below.